My small house is on the big Bloesem. Thanks Irene, for patience and publishing! Sometimes I just use my blog to bookmark websites I don't want to forget. London based Present and Correct is one of them. 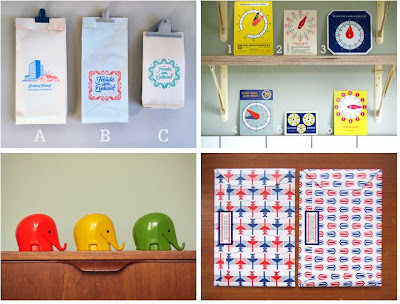 It is an office supply/paper paradise with new and vintage stuff in a great webstore! 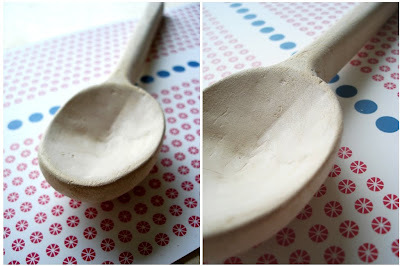 Yesterday my son came home from school with his handmade wooden spoon. This is one of the things I love about the Waldorf school my children are attending (and that I attended some 40 !! years ago...): The respect, love and attention for natural materials. 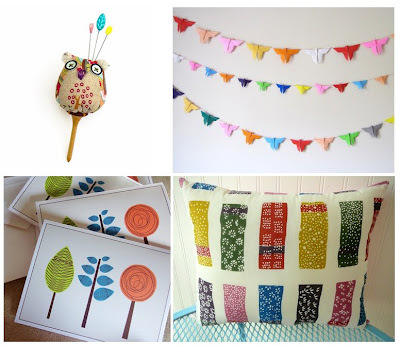 Looking at the souvenirs from my spring journey through Etsy-land I smell grass and I hear birds sing! From top left: An amazingly sweet owl birdie spoolpincushion by Mq Square. 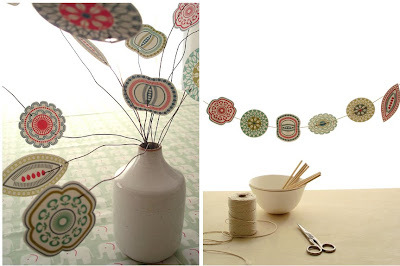 Origami butterfly-garlands by Kim Baise from Jikits. Three happy trees, recycled paper cards by The Craft Pantry. And a lovely cushion with abstract 'flower fields' by Olive. 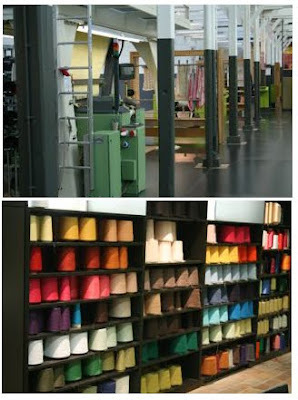 We went to the Audax Textilemuseum last Thursday, to celebrate Engel's 5th anniversary! 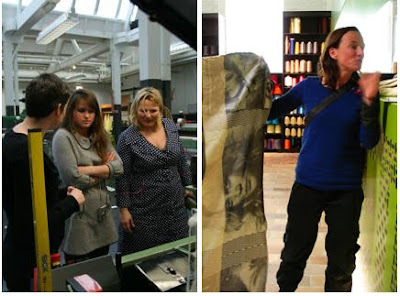 Owner Sabien invited us - her 2 designers (Anouk and me) and her co-worker at Engel (her cousin Vivian) - to design our own woven tablecloth and teatowels and have it produced in the Textilemuseum! Spending the day in the Textile Laboratory, looking at each others ideas and designs....What a feast!!! 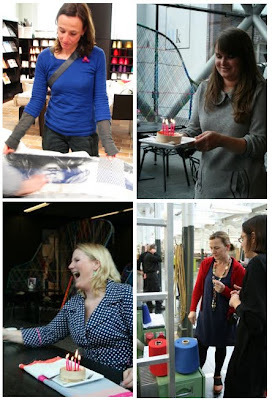 From top left: Anouk looking at her perfect 'photo teatowel', Vivian bringing in the mini-birthdaycake, Sabien making a wish before blowing out the candles and me yo-yoing, as allways, between red and blue! There were lots of choices to be made. 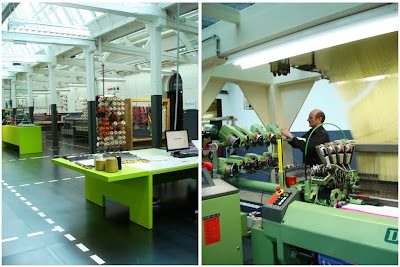 Unfortunately it was not possible to work with more than one colour next to the white warp threads. So my initial design (see previous post) with two colours was no option. But next to that restriction there were millions of ways to combine this white threads with the one colour of our choice. Every so called weave gives another shade of colour. It is just a different kind of thinking: I had to skip from thinking in flat colours and images to thinking in structures. A very interesting process and...hard labour! The moment that our samples were cunjured out of the machine (the loom) was magical! 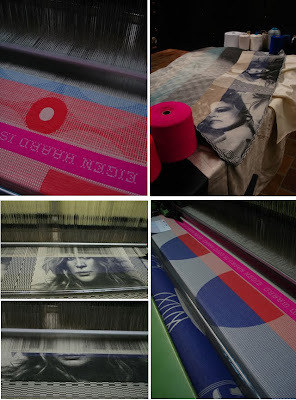 It is exciting to see your design becoming a real textile! We ended the day in the Laboratoy with a complete plan: a digital design combined with choices in yarn, colour and weave. The actual production of the tablecloths will take place later. We went home with our sample textiles. Just before I left I chose a dark blue (indigo) cotton. But the next morning I woke up, showed the samples to my three men and told them that I still was not sure about the colour... My 12 year old son said: 'Mom, take the red! The blue yarn makes the white in your design a bit grey and gloomy'. I called the museum immediately... Red it will be. 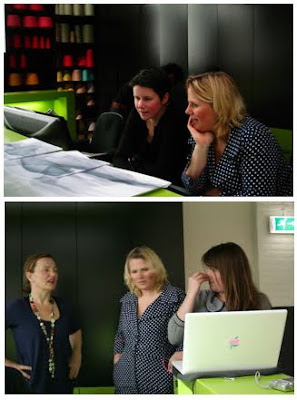 Dear Sabien, it was so much fun to do with you three, it was very educational and a big inspiration boost. Thanks for this great present. You are an Engel (= angel in dutch). 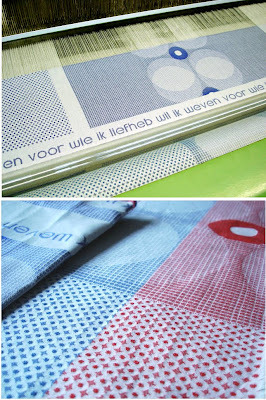 Promised you to keep you posted on the Textile Museum Tablecloth project. Well, next Thursday it is T-Day! I have just sent in my design and before tidying up my workspace I took these pictures. 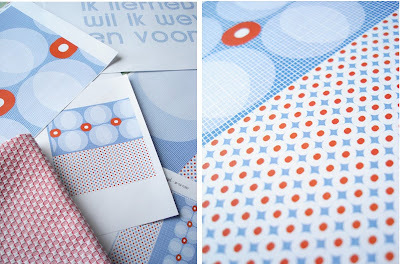 Here you see some sketches, the teatowel that inspired me and a part of my final design! When the tablecloth and the teatowels are finished I'll come back to you with more pics! b l o m ! The designing itself was a lovely and interesting path to walk - developing and producing this one was rather hard. Fortunately I easily tend to forget all the troubles and I enjoy my newborn! This weekend I'll notify my retailers and I hope Blom will travel all over the planet! 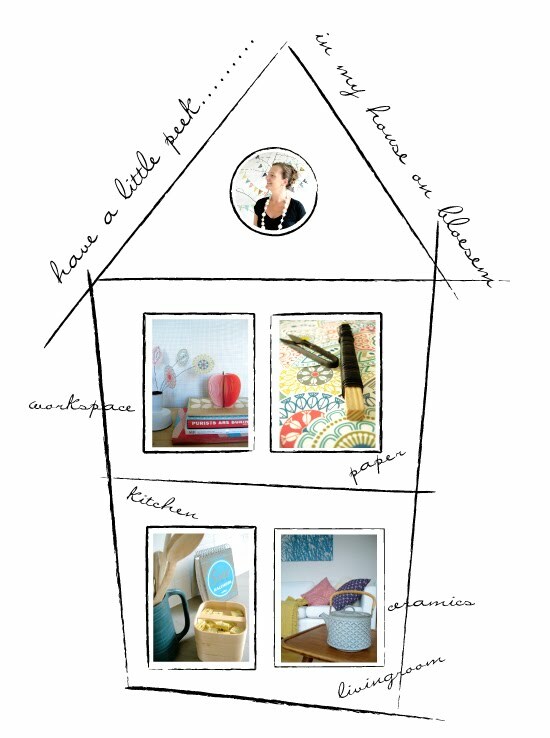 And this (below) is my product text, translated into English by Anne Paris from Cloud 9,who did a great job! Summer or winter, Blom is always in bloom! 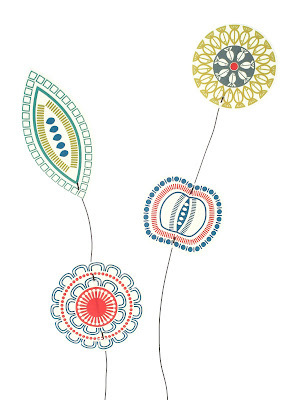 The beauty of Blom is everlasting, in a vase or dropping through the letterbox to greet or congratulate. 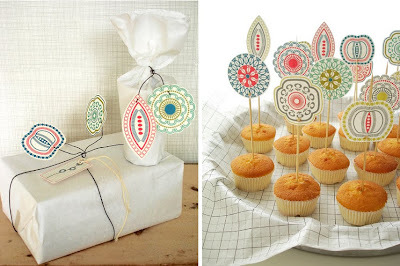 Thread Blom flowers on a string to create instant floral bunting or attach to a cocktail stick to turn fairy cakes into trendy cottage garden treats! 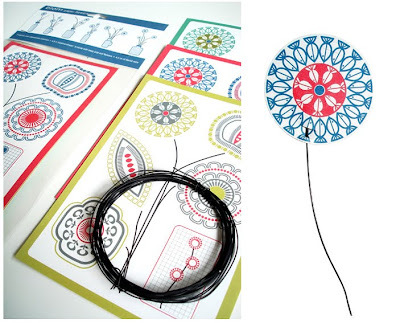 Make your own Blom bouquet by pressing the flowers out of the A5 card and threading them onto traditional florist wire. The cards are available in various colour combinations and each card contains 5 different flowers. Soon available at my Dutch and international stockists!